Aid groups voiced optimism Thursday that the United States would ease restrictions on operations inside North Korea amid warming relations between Washington and the impoverished country. 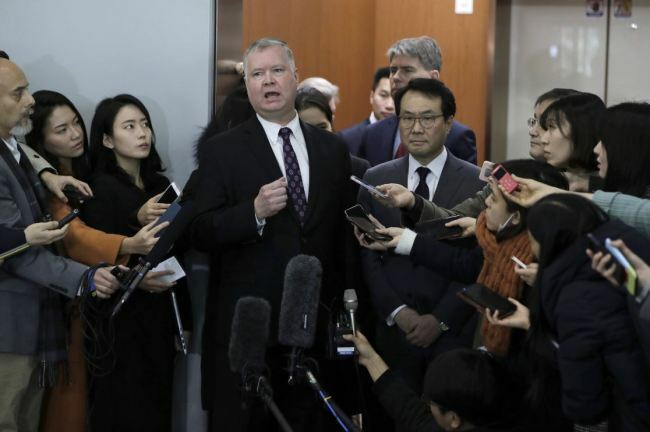 Stephen Biegun, the US special representative on North Korea, met Wednesday in Washington with representatives of aid organizations, which have faced lengthy delays or prohibitions on providing assistance inside the totalitarian state. The UN Security Council has imposed strict sanctions on North Korea over its nuclear and ballistic missile programs. While humanitarian groups can seek exemptions from a Security Council committee, the United States has often refused or delayed consideration of waivers. Richard Blewitt, the permanent observer to the United Nations of the International Federation of Red Cross and Red Crescent Societies, said that the meeting discussed humanitarian needs including food support, health and medicine. Biegun "highlighted that the US recognized the significant humanitarian challenges in (North Korea) and the need by the US government and others to fully enable the humanitarian community to do their work," Blewitt told AFP. Mercy Corps, a US-based non-governmental group that was active in fighting hunger during North Korea's famine in the 1990s -- but halted operations in 2014 -- also voiced optimism and said a follow-up meeting was scheduled. Biegun "made clear that Secretary of State (Mike) Pompeo is committed to considering humanitarian workers' requests, in a timely fashion, to visit North Korea while also taking into account the State Department's concerns over the safety of Americans traveling there," said Mercy Corps spokesman Christopher Allbritton. The State Department declined to comment on the ongoing talks. But speaking to reporters last month in Seoul, Biegun signaled that the United States would be more lenient with aid workers on enforcing its blanket ban on US citizens' travel to North Korea. President Donald Trump is keen to meet soon with North Korean leader Kim Jong Un in a sequel to their historic summit in June, as the United States seeks an agreement on ending Pyongyang's nuclear program. South Korean President Moon Jae-in said Thursday he believed the summit was "imminent" after Kim held talks in China, North Korea's primary ally.